The Oregon State Bar Legal Services Program funds an integrated, statewide system of civil legal aid organizations enabling low-income Oregonians to address critical legal issues directly affecting their families, homes, income, jobs, and access to vital services such as education and health care. 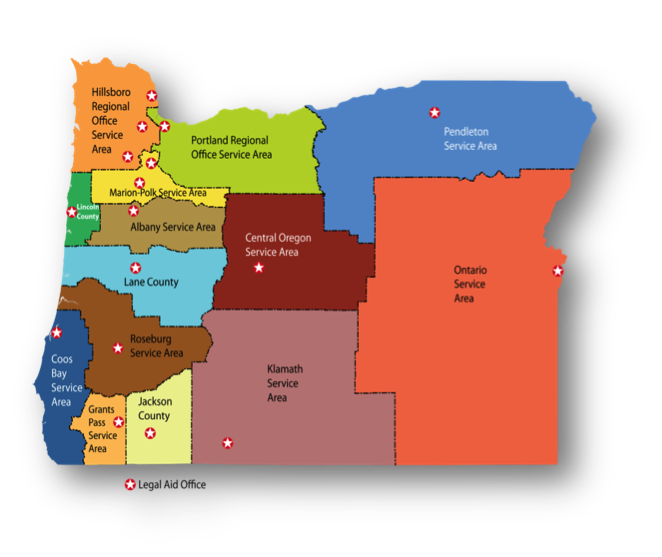 To meet these needs, legal aid providers operate offices in 17 communities together providing service to all 36 counties in Oregon. In 1998, Oregon became one of the first states to form an integrated statewide network of legal aid providers, when the OSB Board of Governors approved the initial Oregon Legal Services Program Standards and Guidelines. To use its oversight authority to work with Providers to ensure that the delivery of services is efficient and effective in providing a full spectrum of high-quality legal services to low-income Oregonians. To work to eliminate barriers to the efficient and effective delivery of legal services caused by maintaining legal and physical separation between providers of general legal services to low-income Oregonians in the same geographical area, while maintaining Providers’ ability to offer the broadest range of legal services required to serve the needs of clients. Governing Structure of the Legal Services Program: The OSB Legal Services Program Committee oversees the Legal Services Program and the funds appropriated to the OSB by the Oregon Legislature. The OSB Legal Services Committee receives direction from the OSB Board of Governors and makes recommendations to the OSB Board of Governors regarding the Legal Services Program. Standards and Guidelines for Providers: The providers must meet guidelines regarding provider structure, use of funds, client eligibility, priority setting, grievance processing, and avoidance of competition with the private bar. The goal of the Standards and Guidelines is to maintain an integrated delivery system designed to provide relatively equal levels of high-quality client representation throughout the state. The standards and guidelines also incorporate additional standards such as ABA Standards for the Provision of Civil Legal Aid and the Oregon Code of Professional Responsibility. Cooperative Collaboration by Providers: The providers must create mechanisms for cooperation among themselves and other programs providing services to low-income Oregonians. Oversight by the Legal Services Program: The Legal Services Program provides oversight to the providers using the tools described in the Standards and Guideline. The periodic accountability process provides the Legal Services Program with information about the work of legal services providers. The process focuses on the effectiveness of the providers in meeting the needs of individual clients and the larger client community and in developing and using resources. The goals of the review are to ensure compliance with the Standards and Guidelines; to ensure accountability to clients, the public, and funders; and to assist with each provider’s self-assessment and improvement. Ongoing Evaluation Activities by the Legal Services Program including peer reviews, desk reviews, ongoing contacts, and other evaluation activities consistent with the Standards and Guidelines. Recent Accountability Reports are available in the Reports section. A narrative description of the provider’s operations, including a description of its needs assessment, priority setting, and grievance processes, which is sufficient to demonstrate that the program complies with the Standards and Guidelines. Complaints about the manner or quality of legal assistance provided in individual cases or the denial of legal assistance in individual cases. Each provider is required to have a written internal grievance procedure to address complaints about the manner or quality of legal assistance provided in individual cases or about the denial of legal assistance in individual cases. The Legal Services Program will not review or respond to your complaint under this category unless you have completed the providers’ internal grievance process. Other complaints, excluding category 1, regarding the overall quality of legal assistance or the performance of the provider. Complaints that providers are acting outside the scope of the statute, ORS 9.574, not in compliance with these Standards and Guidelines, or misusing funds. Ethics or malpractice complaints will be forwarded to the appropriate discipline department at the Oregon State Bar. If you have a complaint please print and complete the complaint form and mail it or email it to the Director of Legal Services Program. The Legal Services Program Committee will not review or respond to a complaint unless they receive a complaint form outlining the nature of the complaint in writing. If you have any questions or need a complaint form mailed to you please contact the Director of Legal Services. Filing Fee/Statutory Allocation: Beginning in 1977, a portion of legal aid's funding came from state court filing fees. In 2011, the legislature continued funding for legal aid but instead of receiving funding from a fee added to certain court filings, which were adjusted periodically and overall funding was increased as filings increased, legal aid now receives a statutory allocation of $11.9 Million per biennium--or $5.95 Million annually per ORS 9.577. General Fund Appropriations: In the 2007-2009, 2009-2011, and 2015-2017 biennia, the Legal Services Program received general fund appropriations. Unclaimed Lawyer Trust Account Funds The Legal Services Program manages the receipt and distribution of Unclaimed Lawyer Trust Account funds appropriated to legal services pursuant to ORS 98.368(2). Pro Hac Vice Fees: Out of state lawyers who are unlicensed to practice law in Oregon may appear in Oregon courts subject to certain rules. The fees for these appearances go to the Legal Services Program to fund legal aid per ORS 9.241. Cy Pres Awards: At least half of funds from Oregon class action settlements and judgments that are either unclaimed or unpayable are forwarded to the Legal Services Program to fund legal services per ORCP 32 O. Beyond funds from the Legal Services Program, providers have 80 sources of funding including federal and state grants and revenue from private foundations. Examples include a grant from The Oregon Housing and Community Services to provide legal assistance for homeowners facing foreclosure, funds from an Oregon Department of Justice grant to serve victims of domestic violence, grants from United Way to provide services to low-income clients and generous contributions from private lawyers through the Campaign for Equal Justice. A PDF version of the LSP Budget is available. Oregonians have a long history of working together to support access to justice; this collaboration is sometimes referred to as the Oregon Access to Justice Coalition. Partners have included Governors, Chief Justices, Judges, Attorneys General, legislators, state and local bar groups, members of Oregon’s corporate community, private lawyers, the Campaign for Equal Justice, the Oregon Law Foundation, and legal service providers. Below are a few of the bar groups and nonprofits that are part of Oregon’s Access to Justice Coalition. OSB Legal Services Program Committee: The Legal Services Program administers the funds appropriated to the Oregon State Bar for the funding of legal aid programs and provides oversight to the programs receiving funding. The Legal Services Program Committee has oversight authority for the establishment and revisions of the Standards and Guidelines and for the evaluation methods to provide oversight of the legal service providers. The Legal Services Program Committee makes recommendations to the OSB Board of Governors. OSB Pro Bono Program: The Legal Services Program includes the Pro Bono Program. Legal Services Program staff work with the OSB Pro Bono Committee to support a statewide culture of pro bono and greater participation by the private bar. Oregon Law Foundation The OLF is a nonprofit with the mission to support access to justice in Oregon by obtaining and distributing funds to provide legal services to persons of lesser means. The OLF’s primary source of revenue is the interest on lawyer trust accounts (IOLTA). The OLF works to educate banks on the importance of supportive interest rates on IOLTA accounts. The private bar also plays a crucial role in getting banks to raise interest rates. The OLF works closely with the OSB and CEJ to achieve its mission. Campaign for Equal Justice CEJ is a nonprofit established in 1991 to help with the mission of ensuring that equal access to justice becomes a reality for all residents of Oregon. CEJ takes a strategic approach to solving the shortage of legal services by educating lawyers and the public about the need and by working to increase resources for legal aid through grants, state and federal support, and by direct fundraising from private lawyers. CEJ works closely with the OLF and OSB to achieve its mission. Lawyers at four nonprofits cooperate to provide legal services throughout the state with offices in Albany, Bend, Klamath Falls, Newport, Pendleton, Portland, Roseburg, Coos Bay, Grants Pass, Hillsboro, McMinnville, Ontario, Salem, St. Helens, Woodburn, Eugene, and Medford. Columbia County Legal Aid In 2011 Columbia County Legal Aid assigned to OLC the responsibility to operate and maintain an office in St. Helens serving low-income residents of Columbia County. Although Columbia County Legal Aid still receives the Legal Services Program funds, the Columbia County office is fully integrated into OLC. OregonLawHelp.org is developed by legal aid to provide free legal information on topics affecting low-income Oregonians.